The Plunge into fitness program requires a minimum of 30 minutes of exercise for 50 days, which totals 25 hours for the eight week period. Any activity that increases heart rate qualifies including: walking, running, biking, playing team sports, skateboarding, swimming, jumping rope, etc. 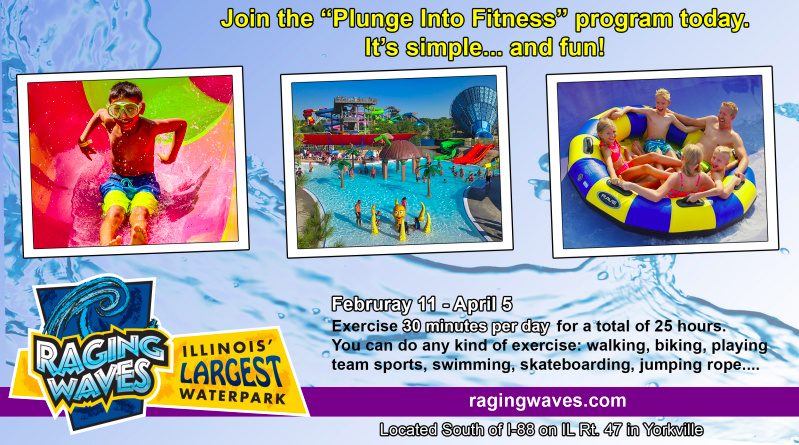 For the duration of the program, each child will complete a fitness log provided by Raging Waves. Once complete, a parent will sign it and the child will turn it into his or her teacher by April 9th (Updated to April 12). All children kindergarten through 8th grade are encouraged to join this program and earn a discount to Raging Waves.